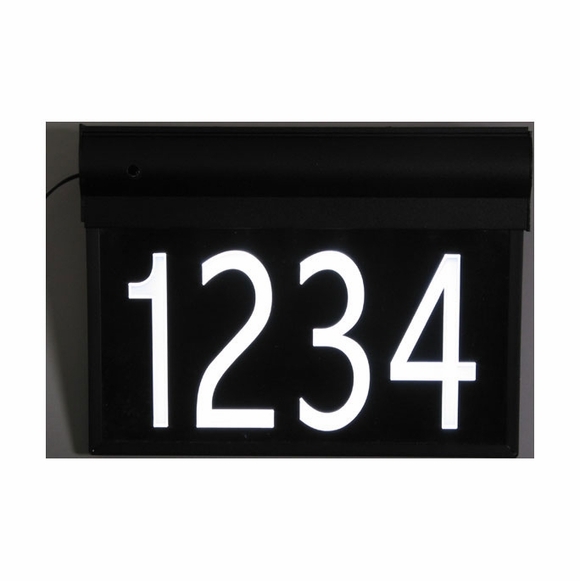 LED address sign automatically turns on at night and off during the day. Brilliant night time illumination helps emergency services quickly locate your home at night. Long-life LED lamps with 10-year life expectancy. This two-line LED address sign holds up to six 3" high numbers and up to eleven 1.5" high characters (including spaces) for the street name. Dimensions: 14"L x 9.5"H x 1.75"D. Completely weatherproof aluminum construction. Includes stainless steel screws, mounting hardware, and 12-volt adapter. 20' power cord. UL approved. 1-year mfg. warranty. The light itself is great, looks nice, right visibility and with 2nd line street name helps my corner lot problem. But the installation instructions could use a lot of help (illustrations obsolete, refers to 20 ft wire not included, doesn't tell how to cut end fitting off power converter wire (leaving the fat section, filter), calls power converter an "adapter" etc (in this day of word processing there is no excuse for obsolete instructions). The bracket design is a problem - does not fit with thickness of the screw heads I had to countersink to use countersink type of screws (my screws) otherwise the heads cause the bracket to tilt greatly with respect to the light. The average customer will not know to do this.